response, Prime Minister Neville Chamberlain presented an ultimatum to Germany in the early hours of that Sunday morning: cease the invasion of Poland or face war with Great Britain (see "The Beginning of World War II, 1939"). Hitler's reaction was to ignore Britain's ultimatum. At 11:15 AM The Prime Minister interrupted the regular radio broadcasts to announce that Britain and Germany were at war. At 11:27 AM London's air raid sirens began to wail. It was only a test, but unlike the many tests that had been conducted before, this one struck home - the country really was at war. Sandbags were hastily filled to protect important buildings, gas masks became required equipment for civilians, the nightly blackout became a way of life and children were herded aboard evacuation trains to escape the danger of the city. On the stretch of green turf by Knightsbridge Barracks, which used to be the scampering ground for the smartest terriers in London, has appeared a row of steam shovels that bite out mouthfuls of earth, hoist it aloft, and dump it into lorries; it is then carted away to fill sandbags. The eye has now become accustomed to sandbags everywhere, and to the balloon barrage, the trap for enemy planes, which one morning spread over the sky like some form of silvery dermatitis. The evacuation of London, which is to be spaced over three days, began yesterday and was apparently a triumph for all concerned. At seven o'clock in the morning all inward traffic was stopped and A.A. scouts raced through the suburbs whisking shrouds of sacking off imposing bulletin boards, which informed motorists that all the principal routes out of town were one-way streets for three days. Cars poured out pretty steadily all day yesterday and today, packed with people, luggage, children's perambulators, and domestic pets, but the congestion at busy points was no worse than it is at any other time in the holiday season. The railways, whose workers had been on the verge of going out on strike when the crisis came, played their part nobly and the London stations, accustomed to receiving trainloads of child refugees from the Third Reich, got down to the job of dispatching trainload after trainload of children the other way-this time, cheerful little cockneys who ordinarily get to the country perhaps once a year on the local church outing and could hardly believe the luck that was sending them now. Left behind, the mothers stood around rather listlessly at street corners waiting for the telegrams that were to be posted up at the various schools to tell them where their children were. disembark from an arriving train. the great unwashed right into the bosoms of the great washed; while determined ladies in white V.A.D. overalls search the mothers' heads with a knitting needle for unwelcome signs of life, the babies are dandled and patted on their often grimy diapers by other ladies, who have been told to act as hostesses and keep the guests from pining for Shoreditch. Guest rooms have been cleared of Crown Derby knickknacks and the best guest towels, and the big houses and cottages alike are trying to overcome the traditional British dislike of strangers, who may, for all anybody knows, be parked in them for a matter of years, not weeks. London and the country are buzzing with rumors, a favorite one being that Hitler carries a gun in his pocket and means to shoot himself if things don't go too well; another school of thought favors the version that he is now insane and Goring has taken over...The English were a peace-loving nation up to two days ago, but now it is pretty widely felt that the sooner we really get down to the job, the better." Mollie Panter-Downes' letter was originally published in the New Yorker Magazine on September 9, 1939, republished in The New Yorker Book of War Pieces (1947). 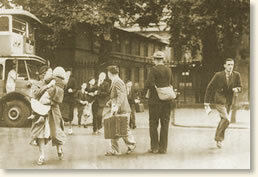 "London Goes to War, 1939," EyeWitness to History, www.eyewitnesstohistory.com (2005). Listen to Prime Minister Chamberlin's announcement of war with Germany. 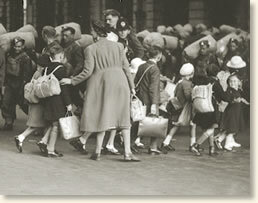 Changed policy - The children evacuated from London were scattered throughout England's countryside. Many were sent to Canada. This part of the policy was halted after a number of ships carrying children to Canada were attacked and sunk by German submarines.